Julia at Arcana Wildcraft released the Dangerous Places collection for fall this year and she also brought back a few more traditional seasonal favorites. 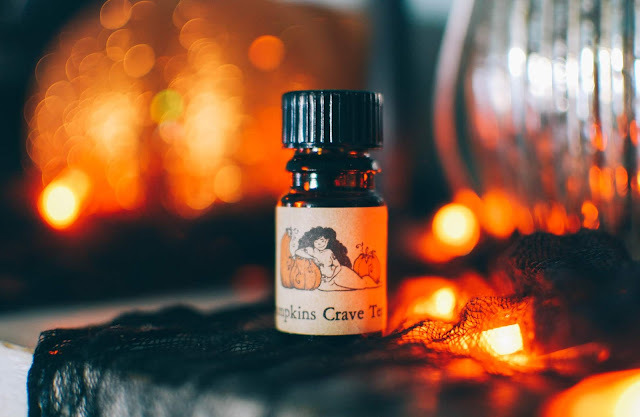 Pumpkins Crave Terror is one I have wanted to add to my collection for some time now as I simply love the original Holy Terror scent. 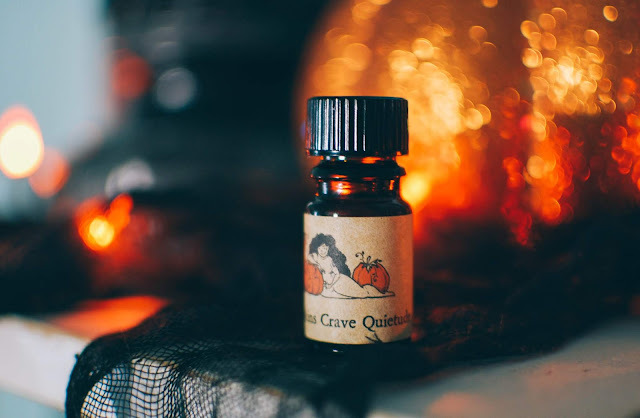 Once I saw the notes for Pumpkins Crave Quietude I knew I needed to get that one too. And heck, a spiced apple scent too? Yep, come home to mama. Concentrated apple cider with rosy sweet tones lift up from the glass bottle. Honeycrisp apples drip their sweet juices along the wrist once applied. This smells exactly like Honeycrisp cider, cool and sweet. Mulling spices rise up as the scent simmers on the skin. It becomes more warm and wooden as times goes on. 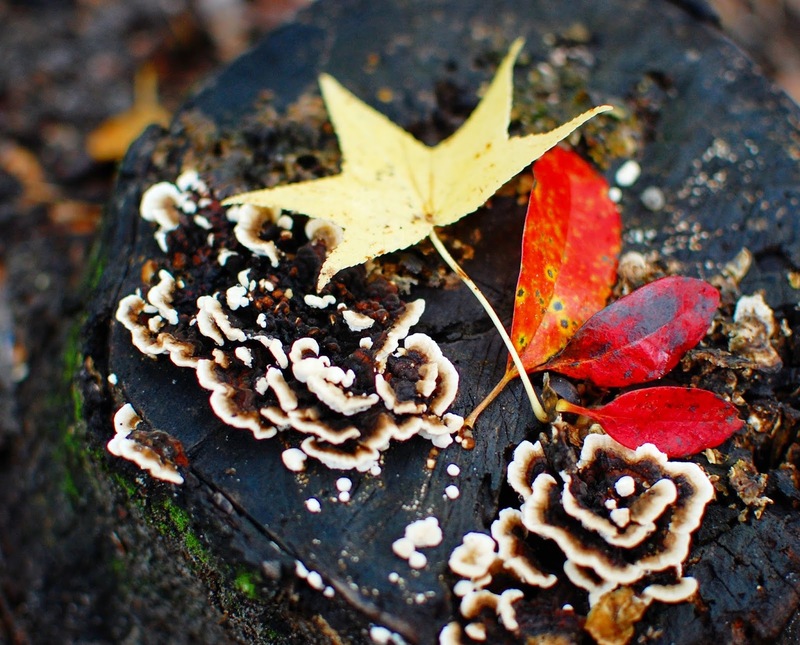 The cider fades into dried apple peels, crisp skins that curl like ruby red lips. Curls of cinnamon bark and curls of apple peel entangled in a wooden bowl. With Julia's apples I tend to get a little bit of citrus zest tucked in there. A zippy aspect that might be ginger but reads a little lemony to my nose. It dries with a faint snowing of dustiness amid the dried apple and ginger and cinnamon. A thick slice of gooey pumpkin pie with a stream of vanilla cream poured on top hovers amid sacred incense when sniffed from the bottle. Awash on the skin, Holy Terror and pumpkin pie braid together. Incense, smoke and beeswax thread with spice and pumpkin pie and even the flaky crust that it sits upon. The crust fades but the pumpkins and terror persist. A smattering of sweetness exists within the smoke and pumpkin. It dries down into the dreamy haze of Holy Terror. I love this version of Terror. Musk and mellow amber and light woods perfume the air when this is uncapped. Fat orange pumpkins whipped into a puree and spiced with the smoky, and almost cardamom leaning, white pepper. Vanilla and spiced amber flow into the pumpkin to create a deliciously divine fragrance. This one settles into a soothing vanilla sandalwood and I simply adore it. 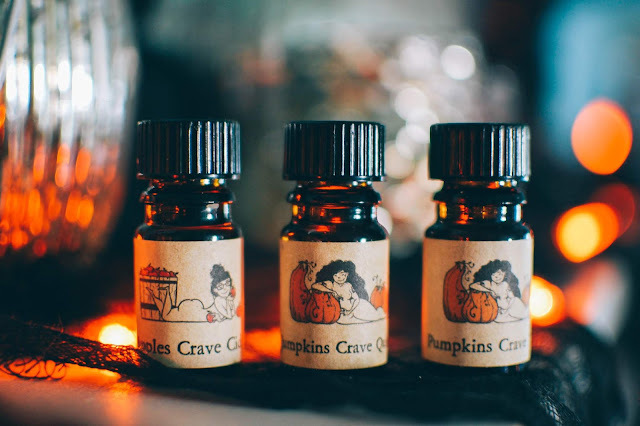 Pumpkin Crave Quietude sky rocketed into my Top Ten list. Stoked Julia brought it back. I had no idea what I was missing. You can purchase Arcana Wildcraft at Nui Cobalt Designs, Sihaya and Company, Femme Fatale (Australia and international) and Pretty Indulgent (Canada). Today begins the October Word Prompt that Deb, at It's Always Something, and I will be doing every day this month. The word prompt might be the entire post or it might be the ending, but it will be there. The decorations are up, costumes are bought, pumpkin spice granola bars are in the pantry, fall is here. 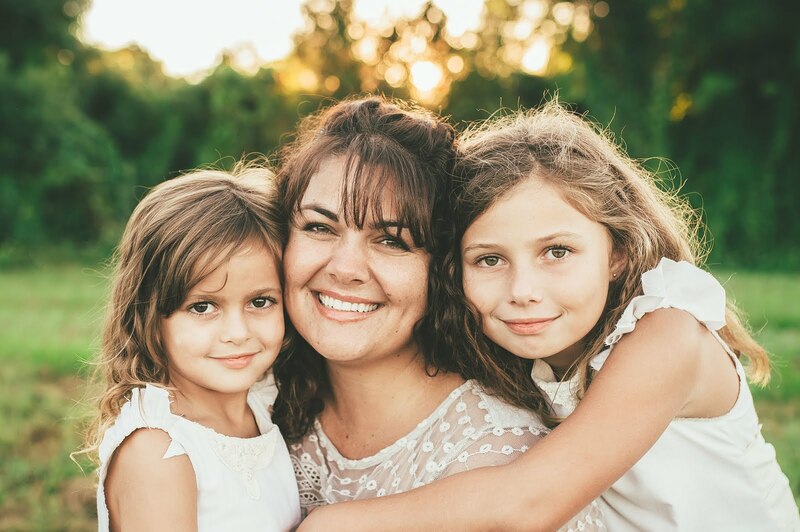 This fall I have some fun traditions and experiences planned. Pumpkin carving, the Five Sisters Crafternoon, the Wizarding World of Harry Potter, apple cake baking, hayrides and leaf collecting. Such yummy sounding fragrances!! Especially apple crave cider. CIDddder. Wizarding world is always a plus in anything in life so going during fall is just a bonus. I believe my mom wants to take my nephew to a pumpkin palooza this upcoming weekend so we will see how that goes. Hayrides, pumpkin painting, pumpkin crafts, corn mazes, the works. The only thing fall related I have consumed thus far is a sample of pumpkin butter popcorn from our local pop shop. I wasn't as wowed as I would have hoped but maybe other fall treats will strike my fancy soon. Hey! I will send you the Apples Crave Cider. It has been a while since I have mailed you a friendship box and it is time. I will start making you one tonight. Pumpkin Palooza sounds so fun! I need to see if we have any fun pumpkin type things to do around Lakeland. We do have Cornfusion but I am not sure how fun it will be with record highs. Ooooooo pumpkin butter popcorn sounds yummy too bad it didn't quite live up to the yumminess. I love the Boom-Chicka-Pop varieties. I need to see if the pumpkin spice one is out in stores. You totally do not have to do that, I want you to keep and savor all your good smellies! Funny enough I have you one started that I have been meaning to send off I just haven't got around to it. Now that all the fun Halloween stuff is out though I need to hold off because I may see stuff I think you could need! :) I do have you some local vendor wax goodies in there for you to try along with some homemade goodies too! Pumpkins crave terror and quietude! I may have to place a tiny order. Lol I'm most excited about our sisters crafternoon. I hope your having a great day! That Pumpkins Crave Quietude seems pretty popular in the Arcana Facebook groups. ;) I've been finding white amber, white musk perfumes do not smell good on me at all.. not sure why. The more indie perfume I try, I'm finding which notes don't smell good on me or which ones I really amp up. So interesting! It is. "White" notes can smell a little harsh and chemical driven on me at times too but for some reason there is nothing "white" about these but more pale or soothing or gauzy. I really love this scent. it is easily my favorite pumpkin scent right now. But it is nice when you know you can cross out a note when trying to figure out if you will like something or not. I notice I can't really do NAVA's galbanum (SO GREEEEEEN) or their tobacco and vetiver from certain houses doesn't read well on my skin.